Dab a Q-tip (cotton swab) in oil-free and alcohol-free makeup remover. 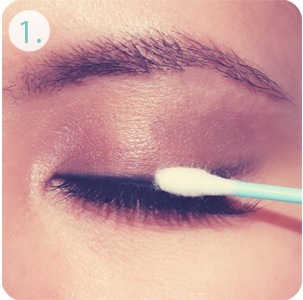 Very gently go along your lash line with the Q-tip to loosen the lash adhesive. Tip: Always remove your Everblinks Mink Lashes before sleeping. Gently peel and remove Everblinks lashes away from the outer corners of the eye. Hold lash at the lash band (instead of at the mink lashes) to prevent damage to the lashes. Gently remove any excess lash glue from the lash band by peeling off thin strips of glue with fingers or tweezers. Always hold your Everblinks at the lash band (instead of at the mink lashes) while removing the glue to prevent damage. For this tutorial we used a latex-based lash adhesive (DUO lash glue). Tip: Make sure to also remove lash glue residue on your eyelids and natural lashes with makeup remover. Store your Everblinks Mink Lashes in the original packaging to maintain shape for future use. Our custom-designed packaging can hold your lash glue, tweezers or other tools. Everything you need for gorgeous lashes is in this cute little box!